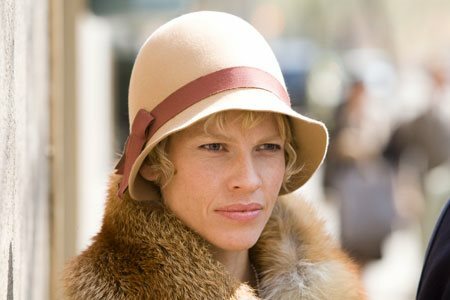 Experience the romance, struggle and triumph of legendary aviatrix Amelia Earhart as she chases love and lives her dreams in Amelia, landing on Blu-ray Disc with Digital Copy and DVD February 2 from Twentieth Century Fox Home Entertainment. Hailed as “The Queen of the Air,” Amelia boldly flew into the annals of history with her solo flight across the Atlantic Ocean. Bound by ambition and love, her enduring marriage to George Putnam could not be broken by her determination to fly, or a secret passionate affair. Equal parts gripping drama, stirring romance and epic adventure, Amelia will take your breath away and send your spirit soaring! Download Amelia in Digital HD from the iTunes store. Amelia images are © 20th Century Fox. All Rights Reserved. Out on Blu-Ray from 20th Century Fox is Amelia, the story of Amelia Earhart, the first woman to fly solo across the Atlantic. The story mainly covers Amelia briefly before she is selected to be the first woman to fly across the Atlantic (but as a passenger). Very little details of her life before then are revealed and are one the larger flaws in the overall story. 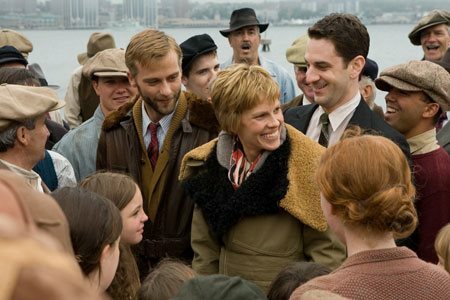 Amelia is played by the Academy Award-winning actress Hilary Swank, who gives her all in another wonderful performance from a truely gifted actor. She is Amelia Earhart, and her performance conjures memories of Meryl Streep as Julia Child earlier in 2009. If anything, if you are a fan of her work, you must see her performance in this movie. Richard Gere plays George Putnam, who published her book and later became her husband. Ewan McGregor plays Gene Vidal (Gore Vidal's father), who is important in the history of early commercial air travel in the United States. The performances are wonderful, but are constrained by the story and script. The movie flips back and forth from her fateful attempt to fly around the world and her past, and sometimes get confusing. But the overall story is okay - the biggest problem is that you can't really get a feel of why Amelia was like she was - and because of that you can't connect on her level. The glimpses are there but don't quite make it. Technically the movie excelled - the scenes are crisp (especially considering that's what Blu-Ray was designed for! ), the surround sound is excellent, and it's impressive that the production team was able to track down one of the few remaining Electra planes left flying - and used it for the scenes of Amelia's last flight. There are no CGI scenes of her plane in the sky - they used the real thing. The brightest spot with the Blu-Ray: the special features. It is chocked full of them, even beyond deleted scenes. They even give you full copies of the fictional "news reels" they made for the movie. Additionally 20th Century Fox is including a free digital copy of the movie, which is a plus. Amelia images © 20th Century Fox. All Rights Reserved.